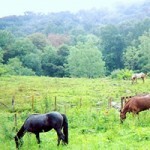 Mounted on a fine horse matched to your skill, explore with us the incomparable beauty of the Great Smoky Mountains. Unique among Asheville trail ride stables, Randall Glen offers horseback riding like you’ve never experienced before, with many miles of unspoiled wilderness trails. Surrounded by breathtaking mountain views, we ride forest tracks and high meadows, through knee-deep wildflowers, past rushing creeks and pioneer cabins. 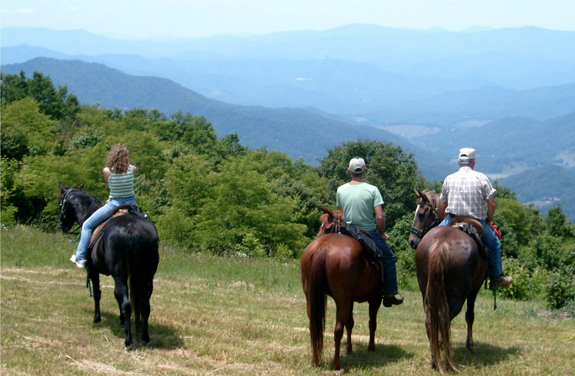 Join us for true North Carolina mountain trail riding. Whether you’re a first time or a lifetime rider, at Randall Glen Stables you’ll have a ride you’ll never forget. Our stable offers quality and luxury far beyond the average trail experience. By their glossy coats and willing attitudes, you can tell that we care about our horses and about their riders. We keep our horses in top condition, and regularly work with each one to make sure it’s dependable, kind, and sure footed. We take pride that with our horses, whether you’ve never ridden before or whether you’ve ridden all your life, you’ll have a great ride. We specialize in small, custom trail rides. Wherever possible, we limit the group to your party alone. We prefer to take out one to five riders at a time. No long lines of nose-to-tail nags-we want our riders to have a true riding experience! And because of our low key, small scale approach, we can customize your ride to suit you. 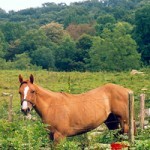 We’ll be glad to tailor the type of trail, the kind of horse, and how long you ride. Our horses are outfitted with Australian saddles designed for the ultimate in rider comfort and safety. The Aussie is similar to a Western saddle, but with a deeper seat, more comfortable stirrups, and “poleys”-thigh blocks that keep you firmly in the saddle even on rough terrain. Best of all, the Aussie can be ridden either Western or English style. We mount you on a horse matched to your size and your skill level, and provide instruction as needed. 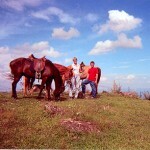 All of our trail rides are led by experienced professional guides.